The world needs more hotels like the Dormero in Hannover: simple, shiny, clean, with a name that’s fun to say and a regular dance party off the lobby. 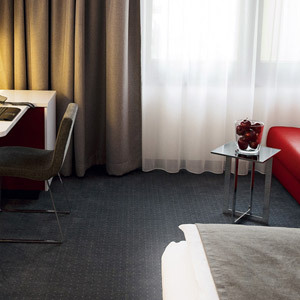 Like its siblings elsewhere in Germany, the Dormero Hotel in Hannover offers no-nonsense modernity. No pampering, but no pretension either. 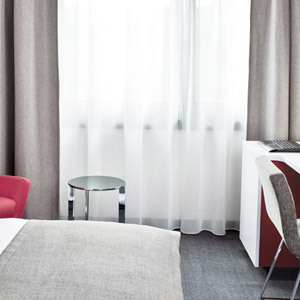 Soundproofed rooms come with two huge screens, one for TV and one for the Internet, perfect for multitasking. Cute red touches offset the white-and-gray décor and prevent the monochrome from being monotone. In addition to the aforementioned party, the bar has the beers you’d expect given the locale. It also has cocktails you might not expect, including one called “sweet & sour meets balls,” which we’re hoping tastes better in German. Screens flash kooky close-ups and forlorn landscapes; occasionally go-go dancers do their thing on tables or the bar to live music. The mellower restaurant skews Italian (a big breakfast is included). There’s also a small spa on site, with workout facilities. Finally, we should mention the free mini-bar, luxe touch in a sensibly priced hotel. As you might expect, the property is popular with business travelers. Steps from the hotel’s entrance is a tram stop, so you’re always fairly close to wherever you need to be. Maschsee, the lovely lake in the center of town, is an easy walk. You can take a boat ride or just take in the scenery.